From Upon Poppy Hill (コクリコ坂から) is a 2011 anime film produced by Studio Ghibli, directed by Goro Miyazaki (宮崎 吾朗), the son of Hayao Miyazaki (宮崎 駿). It's based on the manga of the same title. 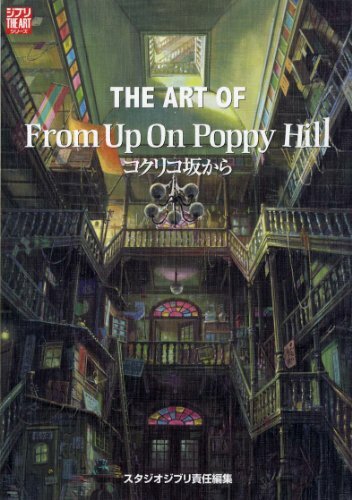 The Art of From Up On Poppy Hill is in the same format as other Studio Ghibli official film art books. It's a 256-page paperback with a texture cover. 208 pages features the art, with the script taking up the rest. The style of the art is similar to other films. It's almost a signature style that's now easily recognisable. There are character designs, background art and scene sketches. Hayao Miyazaki's watercolour sketches are still as sketchy as ever, but there are only a few. The character designer is Katsuya Kondo (近藤勝也). Yes, that Katsuya Kondo who created the characters for the Jade Cocoon game. I can't recognise his art in this book because they look like typical Studio Ghibli characters. His art is still beautiful. The character sketches in various poses are charming and feels alive. Much of the scene sketches are drawn by Goro Miyazaki and Katsuya Kondo. The scenes are always very well composed and worth studying. The background drawings are the actual backgrounds used in the film. These are beautiful drawings of the school, Japanese houses, and the old Culture Club building which is the story point of the film. There's much greenery and it always amazes me how they mix their green just right. The background art is credited to the Studio Ghibli team with no mention of who specifically drew them. There are interviews with Hayao Miyazaki, Goro Miyazaki and Katsuya Kondo, but all in Japanese. Not sure if VIZ media is going to translate this to English, or if the anime is going to be released in English. Recommended to fans of Studio Ghibli art. looking at your video, I can see the style is 100% Ghibli. It doesn't seem to be too outstanding, so I'm not convinced to buy it, but now I'm definitely interested in watching the movie. The cover of the book looks really nice.